David Beckham was once arguably the best soccer player in the entire world. From his talent on the field to his charisma off of it, Beckham was one of the most famous men in the United Kingdom, as well as anywhere where there was a soccer fan base. When news of Beckham coming to play soccer in the United States was revealed, excitement was felt throughout America. Beckham said that he was going to sign with the Los Angeles Galaxy for a record-breaking contract. But Beckham was never a flashy player. He was never a big goal scorer. He was a position player who was great at his job. Unfortunately, in America, his skills were not well accepted and he was cast off as a bust due to his lack of goal scoring. In essence, Beckham’s career crashed hard in Los Angeles. This weekend, Beckham’s car crashed hard in Los Angeles. Friday morning, on the 405 Freeway going south, a car broke down in the carpool lane. Beckham was driving in the carpool lane and realized that the car in front of his was not moving a bit too late. As a result, Beckham, with his son in the passenger seat, crashed into the stopped vehicle. Beckham was driving to the Home Depot Center for practice when the incident occurred in Torrance, California. According to a spokeswoman from the California Highway Patrol, the man in the stopped car was taken to a hospital. His injuries were described as minor. 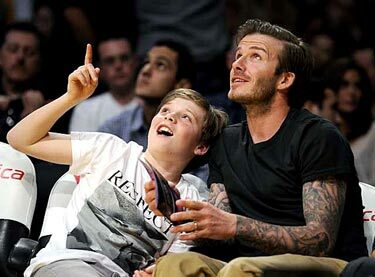 Neither Beckham nor his son, Brooklyn, were injured in the accident. Beckham’s stay in Los Angeles has not been very friendly to him in terms of his career or his driving. His soccer career has essentially faded in the United States and now he has to deal with everything that will come with insurance fees, damages to his car, damages to the other drivers car, and potentially a lawsuit from the driver of the other vehicle if the man chooses to do so. For one very rare weekend, it is not a good time to be David Beckham.